I am chuffed and cheered that due to sheer lucky timing (and my tardiness in writing posts for this blog) Robert’s track is the one I am able to present to you this Christmas. So here on a nippy Tokyo morning at 7am I thought I’d try Googling “Robert Wyatt Christmas” and immediately found – this!!! Click on the jolly pic to hear this lovely track from his collaboration album “For The Ghosts Within.” Some may ask, why on earth did he cover a corny old chestnut like “What a Wonderful World?” Well, think about it – the bloke who sang it first was no mean musician himself! And they both sport irresistible smiles born of lives of hard knocks and unswerving musical dedication. I first hooked up with Robert via the kind introduction of a neighbour of mine in Notting Hill, Julie Christie. I had heard that she knew Robert and sent her a note, and in a very short time had acquired his address, a lovely spot in Twickenham. I used to bump into Julie on occasion in our street. She of course looked drop-dead gorgeous and sported an amazing hairstyle similar to Pinups-era David Bowie, where each hair seemed to stand up on its own and move independently, rather like a sea anemone. I have never seen hair quite like it since, and sadly have never seen a photo of her from this period. So off I went to Twickers carrying my trusty Revox. Alfreda greeted me cheerily and took me in to meet Robert. While I set up the recording gear, a bottle of white wine was swiftly opened and Robert downed a couple of glasses, quite nervously it seemed. I put the Revox into record mode and off he went. Some languid piano improvs ensued, as Robert gazed through the windows at the verdant green garden outside: then quite suddenly he went into Frank Sinatra’s “Strangers in the Night,” at which point I nearly spluttered into my wine glass, but managed to stay silent. He kept singing the title over and over, accompanied by his beloved minor 9th chords, and the feeling became more and more eerie with each repetition. “Do what you like with that,” said Robert generously. A few days later I had the time to sit down and listen to the recording. The one-minute limit got me thinking how to consolidate it into a nice compact arrangement. A loop seemed a good idea (from listening to the loop at length, the rearranged title was created). The phased vocal loops increase in intensity, Robert’s rolling piano builds gradually – and finally that lovely voice comes in, leading to the grand finale with several Roberts singing the last “you’ve got me.” The track was built up by repeatedly copying the ever-growing mix from one stereo tape recorder to another and back again while adding new layers (no multitrack machines in Pipe Studios). The tape noise built up too, so rather than trying to filter it out and lose clarity on his voice, I masked the noise by adding some insect-like synth burbles on my trusty VCS3. “I like the little insect sounds,” wrote Robert after hearing the mix. As usual, it was written in lovely coloured crayons on one of his homemade postcards fashioned from discarded items such as an empty cornflakes box (he was way of ahead of most of us when it came to recycling). Nearly 30 years later he recycled a letter I wrote letting him know that Miniatures had been reissued as a double CD, and asking him where to send the modest royalties that had accrued. He returned my letter, adding a note at the bottom: “Dear Morgan, thanks and good luck with the splendid reissue. Don’t worry about the pennies, didn’t do it for that.” Succinctly and kindly, he had summed up the feelings that I think were common to most of the artists involved in this nutty project thrown together on a shoestring. Apart from “Little Red Robin Hood” a rough’n’ready but endearing 1999 documentary covering Robert’s life story, there is an unforgiveable lack of videos available, except for various odds’n’sods on youtube. An excellent BBC program from 2002 called “Free Will and Testament (The Robert Wyatt Story” contains some beautiful studio performances. Here’s an excerpt. In it I noticed Robert enjoyed a glass of wine and a fag while performing, though I hear that he has since quit both. Well done – here’s to your good health sir! In 2007, the Delta Sax Quartet invited me to arrange a track by Soft Machine (Robert’s band 1966-71) for their album “Dedicated to You… But You Weren’t Listening”. I greedily decided not only to merge two Softs tracks (“Moon in June” plus “Out-Bloody-Rageous” became “Outrageous Moon” – which I dedicated to Keith Moon, old drinking mate and madcap genius drummer for The Who), but to sing on it as well. 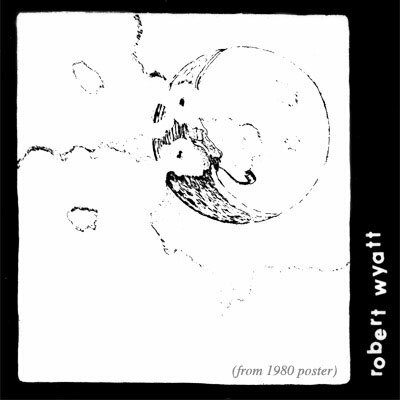 Robert is amazingly gifted at being able to leap tall intervals at a single bound, and it took me a while to get through the musical obstacle course of his fascinating Monk-like vocal melodies. Hear a short clip here. These days, Robert’s unique voice pops up here and there on gorgeous films and thrilling superstar gigs. He has truly become a living national treasure and, for over forty years having ploughed a long, meandering, ever-deepening furrow, continues to rush out albums at the rate of about one every five years. And every one is a gem well worth waiting for. 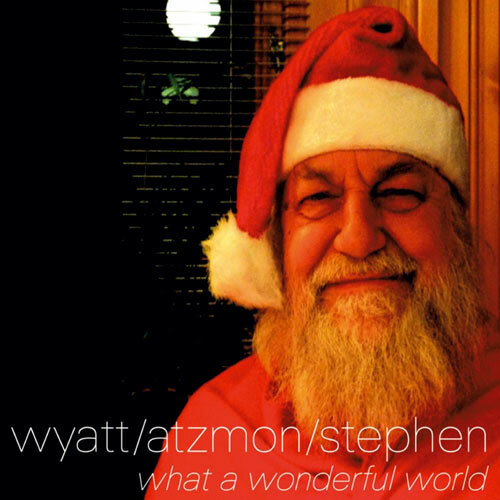 I’m dreaming of a Wyatt Christmas!